I got myself a drive on mast base,supplied by Simon (2E0HTS),and a 20ft telescopic mast that I bought of terry (G4AFS) and I had a yaesu ft-480 multimode 2 meter radio , BUT it went and died on me last week, My plan was to use my Yaesu-ft-8800 in the car by putting the coax in the boot mount, but Josh suggested he bring along his Icom IC-706.and and a 20 mtr (14 MHz) mobile whip and mag mount. so we could use SSB on 144 MHz as well as 20mtrs ( 14 MHZ). 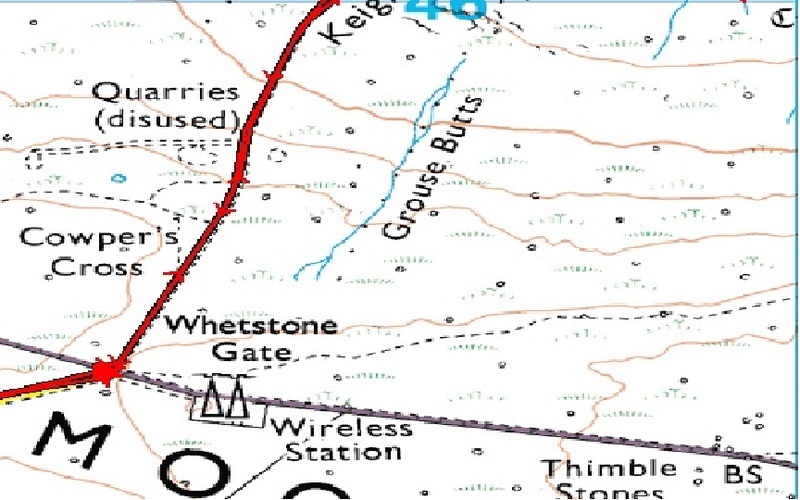 I drove to Keighley Gate ,a pair of de-commissioned radio towers.On an ordinance survey map it is called Whetstone gate 1284 ft ASL 53,54.18.8N 01,50.43.9W MH locator IO93bu . I don't know if it is counted as a sota spot or not , maybe someone can comment on that.
. I proposed we should meet up at about 10:30 on Sunday the 26th.everything was good to go ,all was set. so off we went. working Flatside to begin with. We then changed to vertical and all the sota operators heard us . Josh ( M0DIT) being the rotator for a change. It was Interesting up there to say the least,Being that high up it got a bit windy so we needed to be well wrapped up.Although the wind wasn't that bad but it was a bit chilly if you stood out to long, fortunately Josh brought some coffee with him. Another suggestion was put forward that maybe we should take off somewhere out of Keighley when the weather gets warmer and do a bit of camping & take along more radio equipment and more antennas , Sounds like a good idea to me , what do you think ?